The Hotel was under renovation although this was stated in the Booking.com profile not only was it under reno but the restaurant was affected the bar (no bar) was affected...not just the swimming pool and parking lot. Location was great for Rupp Arena. Breakfast was really good. Lady that cleaned room was really nice and did an awesome job. Beautiful hotel, older, but updated with a lot of charm. I loved the furniture. Staffing was so nice, hotel was very quiet and clean. The staff was very kind and helpful! It was easy to find, and very relaxing stay. The food was good in the restaurant. The beds were very comfortable and all white linens. The staff was very eager to help. The property is historic and elegant, it is not all modernized but has modern accents; TVs, lamps etc. Room service is too expensive to be served in paper boxes. The staff was extremely friendly and polite and the hotel has a lot of charm and character. Perfect location, close to commonwealth stadium and close to ksbar that we wanted to try. Our 1st trip to Lexington to see one of our horses race. This was the best trip we have taken all year! Great hotel, wonderful staff. Great location. 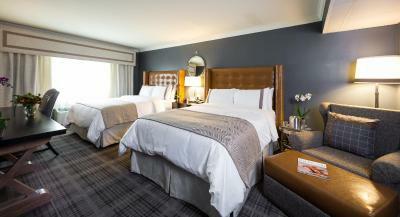 The Campbell House Lexington, Curio Collection by Hilton This rating is a reflection of how the property compares to the industry standard when it comes to price, facilities and services available. It's based on a self-evaluation by the property. Use this rating to help choose your stay! 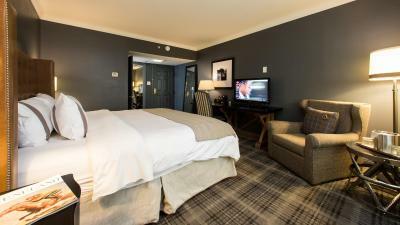 Located near downtown Lexington, this hotel is near the University of Kentucky (0.6 mi) and the Keeneland Race Course (4.3 mi). 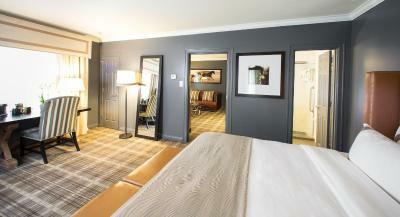 It features on-site dining, free parking, and free in-room WiFi. 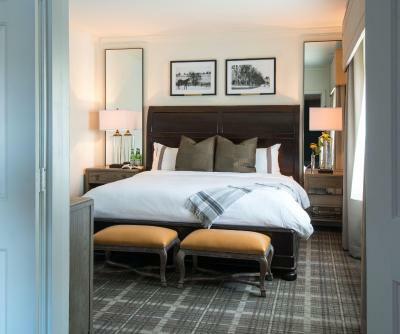 The rooms at The Campbell House Lexington, Curio Collection by Hilton each feature a flat-screen cable TV, pillow-top mattress and desk. Extras include a coffee maker. The Lexington Convention Center and the Lexington Opera House are less than 10 minutes' drive from the Lexington Campbell House. 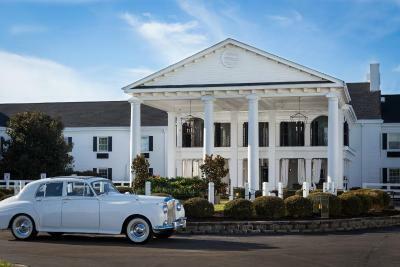 When would you like to stay at The Campbell House Lexington, Curio Collection by Hilton? Featuring a seating area and desk, this room comes complete with a private bathroom. 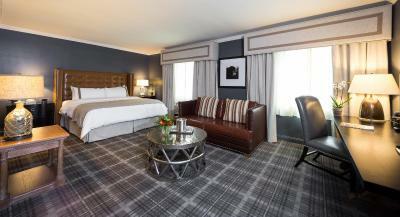 The deluxe queen room includes a seating area and desk. 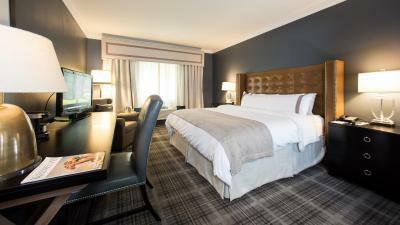 This double room includes a 37-inch flat-screen TV, oversized leather headboard with a pillow-top mattress, and a white tile bathroom. This guest room includes a 37-inch flat screen television, oversize leather headboard with pillow-top mattress, and white tile bathroom. The Campbell House has long been a part of the Lexington community, and is still creating wonderful memories for many of our guests. The history and uniqueness of our property provides an authentic local experience and strives to reflect central Kentucky culture and hospitality. 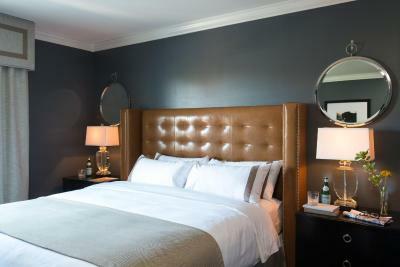 House Rules The Campbell House Lexington, Curio Collection by Hilton takes special requests – add in the next step! 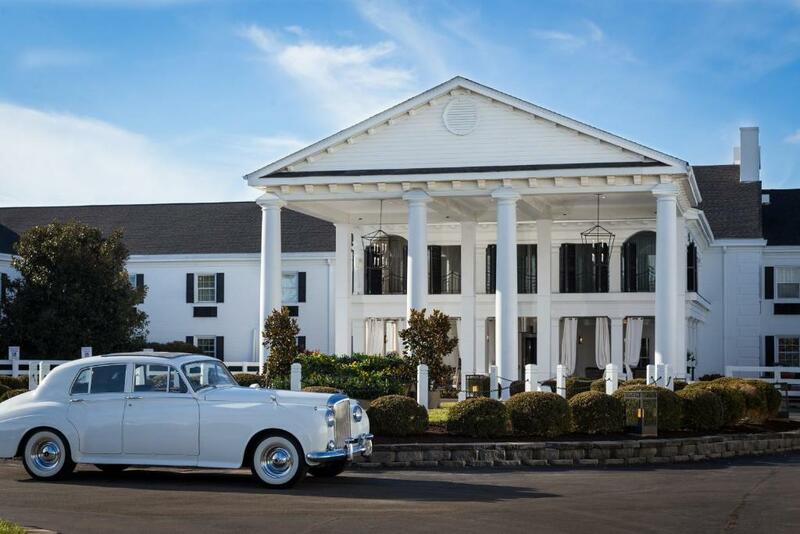 The Campbell House Lexington, Curio Collection by Hilton accepts these cards and reserves the right to temporarily hold an amount prior to arrival. Please note that effective June 15, 2018 until April 15, 2019 the property will be undergoing an expansion and redesign of public and meeting spaces and upgrades to guest rooms. Please anticipate that there could be noise interruptions throughout the day (hours to be determined). The noise of the current renovation. Additionally I paid $90 more by using Booking.com than if I just booked directly the the Hotel. I brought this to Booking,com attention days before we even checked in and nothing was done. The restaurant staff were friendly! Corridors are dark and long. Rooms are very spread out. Rooms and rest of hotel (part from reception) are dark and dowdy. Bathrooms are so small the are impossible for women to get ready. Suites are not worth as the additional “sitting room” is an undecorated box with little more than a couch and TV. No refrigerator in rooms. No convenient vending machines in comparison to the size of the property. Construction was not good and felt that it limited the amenities for the hotel. No bar Didn’t like being charged extra in case I bought something at hotel. Construction was awful..Food prices were way too high..no easy access to Ice or Drink Machines..fire alarm kept going off in room..had car trouble and there was no way the staff had access to help..no call list..though they tried very hard to help,,no amenities in room..I got screwed by the booking people .was told by UK Hospital I could get discount from CH and put it in my reservation request..but when I checked in the Booking agency price $158 was locked in and prepaid so I couldn't get your discount at $109..Had a miserable time..
no mini frig in the room. Should have been advised hotel was under extensive renovations. Manager Mustafa was extremely rude when I called after check out to have rewards added to reservation. The hotel also is not easy to navigate. Will not be back! Kind of a dark atmosphere, more lighting and pictures in the halls would improve the atmosphere I think, but really it was a great experience.